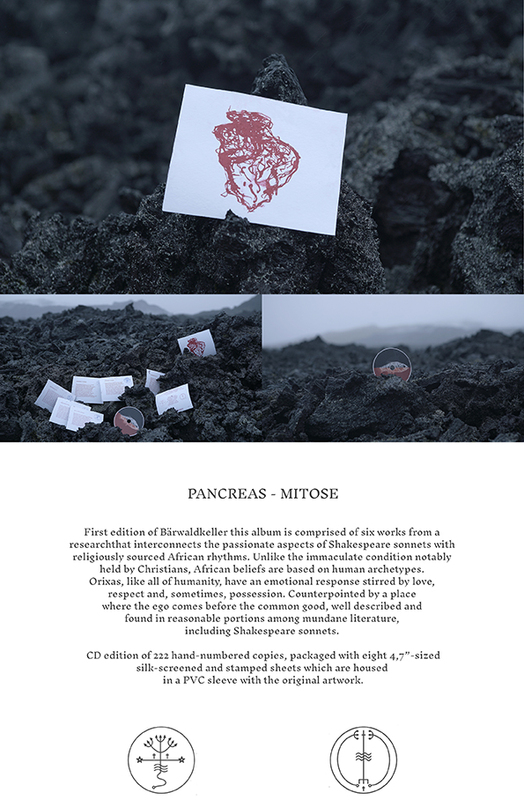 CD edition of 222 hand-numbered copies, packaged with eight 4,7”-sized silk-screened and stamped sheets which are housed in a PVC sleeve with the original artwork. First edition of Bärwaldkeller this album is comprised of six works from a research that interconnects the passionate aspects of Shakespeare sonnets with religiously sourced African rhythms. Unlike the immaculate condition notably held by Christians, African beliefs are based on human archetypes. Orixas, like all of humanity, have an emotional response stirred by love, respect and, sometimes, possession. Counterpointed by a place where the ego comes before the common good, well described and found in reasonable portions among mundane literature, including Shakespeare sonnets.